Little ones will just love making up pretend play scenarios in this play living room. 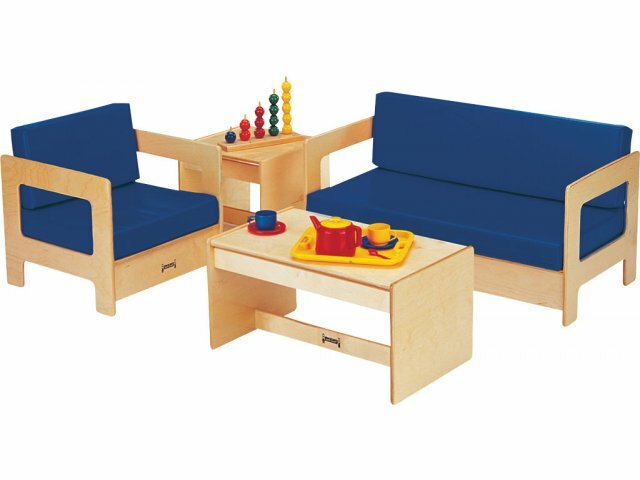 With a couch, easy chair, coffee table and end table sized just right your students will have a ball playing house or relaxing with a good book. This full set encourages children to use their imaginations as they play and learn together. With all of the enthusiasm and energy that little ones bring into the classroom, a sturdy play living room is definitely worth the investment. Baltic birch frames and tables have tough dowel and pin construction and rounded edges and corners for safety. Soft, low-maintenance vinyl cushions offer cozy seating. 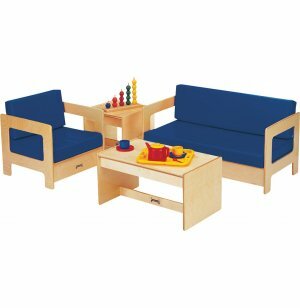 If you are looking for a way to enhance your pretend play center, this set is a great choice. Complete Set: Includes a couch, easy chair, coffee table and end table. Comfy Seats: Padded couch and chair are great for a reading nook. Solid Wood: Natural wood frames and tables provide an unbeatable combination of strength and beauty. No Scratches: Fully-rounded edges on all sides on wooden pieces prevent injury on all sides. Tough Build: Dowel-and-pin construction increases strength by 30%. Full Coverage: Ultraviolet acrylic finish is environmentally-friendly and super durable, offering extra-strong resistance to daily wear.